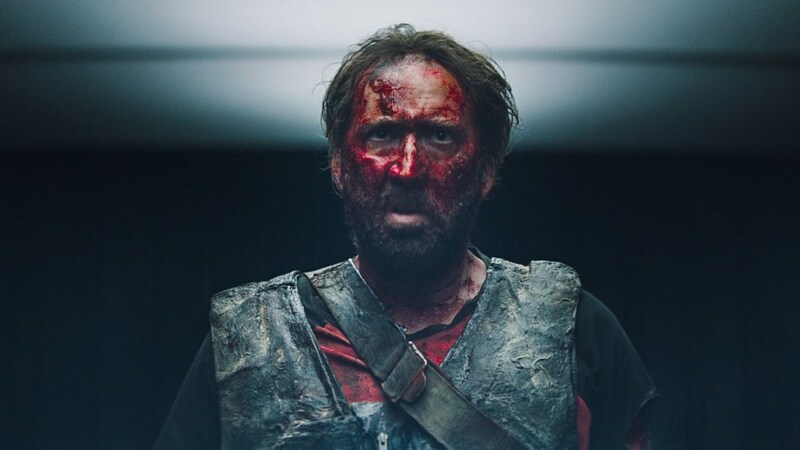 All due respect to the many Nicolas Cage movies that find him going unhinged, they've got nothing on Mandy. This deranged horror/revenge thriller from Panos Cosmatos, the director behind the bizarre, cultish Beyond the Black Rainbow, will appeal to fans of the filmmaker and of Cage, with everyone bursting into applause each time the actor lost his grip on sanity. Cage, channeling a little bit of the rugged luberjack he played in Joe, takes on the role of Red in the 1983-set film. 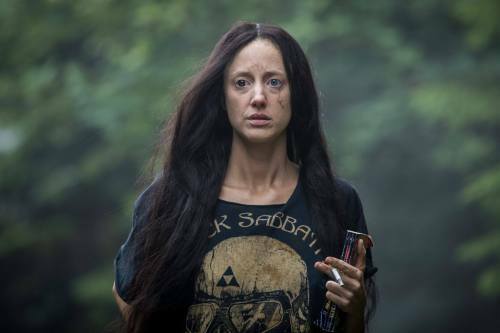 Red lives in the Shadow Mountains with the love of his life, Mandy (Andrea Riseborough), off in their own little world, a calming, peaceful existence that is just the two of them. She's into reading macabre, supernatural horror novels, and talking about the universe. Red, he just seems happy to be around Mandy. She is his everything. It can't last. A chance encounter with a roving band of demented religious extremists leads to Andrea becoming the obsession of their leader, Jeremiah (Linus Roache). Blowing on some extra-dimensial horn, a foursome of leather-clad biker goons attacks Red and kidnaps Andrea so she can be inducted into Jeremiah's odd little band of circus freaks. When tragedy strikes, Red is forced to embrace the darkness within himself and go primal on the "hippie religious freaks." Fans of Cosmatos will recognize what is becoming his signature style, luminous but ominous colors that transport you into an unrecognizable abstract world. Heavily influenced by rock musicals, Cosmatos uses the film's soundtrack to drag you deeper into the abyss from which his characters exist. The first hour of the movie belongs to Roache, whose Jeremiah is like all of the worst cult leaders rolled into one, then given an extra dose of crazy juice. As he rants and raves about higher powers and otherworldly realms, most of what he's going on about will fly over your head. It's enough to know that he's not exactly playing with a full deck, and will put his wacko beliefs into action. But he's got nothing on Red. The second half of the film is all Cage as it transforms into an Army of Darkness-esque splatter fest. Proving he can go full gonzo as well if not better than Bruce Campbell, Cage unleashes madness like nothing we've ever seen from him. Armed with a vicious crossbow dubbed "The Widowmaker" and a nasty bladed weapon he forges himself (not unlike what we've seen from Bruce Campbell's Ash), Red shows no mercy and it would be impossible to do justice to the level of face-melting carnage on display. For all of the violence on display Cosmatos and Cage combine to make a movie that is actually pretty funny, if you have a seriously sick, demented sense of humor. In what i think is the film's funniest, pure Cage moment, Red locks himself in a bathroom, howling with rage, anger, and grief. Covered in deep, bloody wounds, Red grabs a bottle of vodka and begins to chug. Between gulps his howls continue, growing louder as he pours the liquor over his shredded body. The scene goes on for minutes, and with every swallow it gets more ridiculous. Only somebody like Cage could pull it off. Mandy will appeal to those who are down with Cosmatos' embrace of the grisly and grotesque. It reaches such a level that some may not be able to handle a full two hours of it. But the wait is well worth it to see Cage in a psychotic performance that will certainly mark a highlight of this stage of his career.